I’m no physics guy, but from what I gather, that was one hell of an explosion that occurred Tuesday 300 feet below the border of Switzerland and France. Infinitesimally small but immensely powerful. Two subatomic particles travelling just below the speed of light on a collision path around a 17-mile super-conductor tunnel, successfully smashed into each other, creating 7 trillion electron volts worth of energy and conditions resembling the first fractions of a second after the birth of the universe. The great hunt is on; researchers at 10,000 laboratories across the world will be looking at the results of this and dozens of subsequent explosions in the years ahead for mysterious subatomic particles that are only theorized to exist. Along the way, they may create tiny black holes and open the door to the discovery of other dimensions. This is pretty heavy stuff. It’s been a neat and romantic supposition that the world of the very large and the world of the very small are very similar; that electrons orbiting a nucleus are like planets circling a sun. It doesn’t work like that. Electrons don’t orbit. They sort of appear and disappear and appear again at a different place in proximity to the nucleus; no one can predict where they are or where they’ll turn up next. This incongruity between the cosmological scale and the particle scale drove Albert Einstein nuts. He figured all his theories that proved correct about time, gravity, light and the behavior of physics in the cosmos would be replicated in the small world of particle physics. He went to his grave hunting for the elusive “unified theory” that would have predicted how both worlds operate. 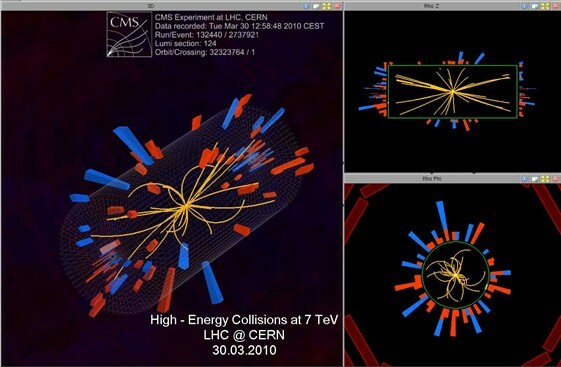 The two worlds are, indeed, very different and the European Organization for Nuclear Research (CERN) has put a $9.4 billion bet on the table that through it’s massive super-collider, the small world may reveal startling answers to exactly what happened in the moments after the big bang brought everything into being. This is a huge step toward unraveling Genesis Chapter 1, Verse 1 — what happened in the beginning. This is a Genesis machine. It’ll help to recreate the most glorious event in the history of the universe. Einstein may have found it ironic and perhaps irritating that particle physics might someday solve the puzzle of the origins of the larger world he pretty much figured out.